The problem is, the amount of calcium that we pour into the body is not directly related to how much calcium is in bone. There has to be sufficient calcium consumed in order for a bone to take up calcium, but ‘pouring it in’ is not an impetus for bones to take up calcium. Why did you write a book on bone health? Osteoporosis is a serious problem. One woman in six will fracture a hip during her lifetime, that’s a really high risk. A fairly large number of men will also suffer a hip fracture and once someone does, it’s very common that their overall quality of life will decline. Sometimes it puts them on a much faster path to their eventual demise. Fracture rates are highest in countries that consume the most dairy and calcium. Countries that consume little or no milk, dairy or calcium supplements have 50% to 70% lower fracture rates. The World Health Organization coined the term the calcium paradox because the places where they’re told to ‘drink milk for strong bones’ are the places we’re seeing much higher rates of osteoporosis! After digging into this, Michael Castleman and I wrote our book, Building Bone Vitality. Based on your research what does the current strategy for treatment and prevention of bone health typically include? Increase dietary or supplemental calcium. Make sure your vitamin D status is adequate. Although often this is a general‘take vitamin D.’ I think it’s important that we look at vitamin D status before we routinely add supplements to peoples daily regimen. Add some regular movement into daily activity, especially weight bearing physical activity. What assumptions are taken for granted in the current recommendations for bone health? Just like with muscles, having sufficient protein available in the diet is necessary. However, adding more protein in the diet doesn’t make the muscles grow. It’s using the muscle that makes muscle grow. Similar with bone, it’s using the bone that makes the bone take-up more nutrients needed for rebuilding. So there’s an assumption that just pouring calcium into the body is what is going to be the trigger for new bone growth and of course it’s not! On top of that, we’re not thinking about ways that calcium moves out of bones. If you disagree with the current recommendations for bone health, what would you suggest we do instead? 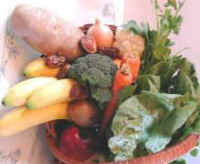 ONE Choose a diet very rich in plant foods and extremely limited or completely absent of animal food. This helps produce overall good health. TWO Pay attention to getting a good variety of foods from plant sources. There are 17 different nutrients that bones need. We need to take the emphasis off of calcium and focus on a diet that will create an environment in the body in which bones want to make new bone and not un-form or break down. To do that we need a healthy, whole foods, plant-based eating style and we need to move our bodies. THREE Exercise. The literature demonstrates it does not have to be high intensity or weight lifting, but it does need to be regular. Walking, dancing, gardening etc are all fantastic activities for bones! Hiking is also great, even better than walking on a treadmill because when you’re on a treadmill you use the same muscles and bones over and over again. If you are walking on a trail you’ll do some side-to-side, climbing, you might be going downhill, you’re going to stress the bones in different directions- in ways that you wouldn’t get on stationary equipment. I also recommend that people use their arms! Knead bread, garden, or do yoga! FOUR Know your vitamin D status. If it’s not adequate, work with your health-care provider to get it back to adequacy. SUMMARY Eat a plant-based diet then go outside and play! Amy Lanou, PhD, Associate Professor and Department Chair of Health and Wellness at the University of North Carolina Asheville. She serves as the Senior Nutrition Scientist for the Physicians Committee for Responsible Medicine. Dr. Lanou publishes regularly on the relationship between vegetarian diets and dairy products and health, and is the author of Building Bone Vitality and Healthy Eating for Life for Children.